I have a newfound respect for that unfunny dork, David Schwimmer, after RUN FATBOY RUN. 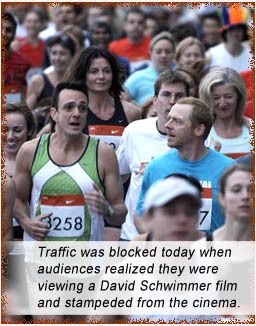 Schwimmer directs Simon Pegg as Dennis, a man who ran from his pregnant bride at the altar five years ago and now decides to win her back by beating her current boyfriend at his own game – marathon running. The plot only seems ludicrous until the hilarious performances take hold. Once Pegg (as the titular “fatboy”) and Dylan Moran (as best friend, Gordon) find their comedy stride, so to speak, there are no stops for any pisses by the roadside in this quirky buddy flick disguised as a romantic comedy (blecch, hang on while I wash my mouth out…). In RUN FATBOY RUN, it’s tough man-love all the way, as one buddy actually betrays the other – but makes up for this darkness by getting naked at every opportunity. Written by solid American comedian, Michael Ian Black, and tightened up by Simon Pegg himself, RUN FATBOY RUN is very much a “British” movie (set in Britain, peopled by Brits) with very little dumb American slapstick; only rarely do we feel Schwimmer’s stupid FRIENDS fingerprints sullying the production. In the Training Montage (which involves tiny short shorts and spatulas), the filmmakers tip their hat to Trey Parker and Matt Stone by having a TEAM AMERICA poster in the background (a movie in which The Montage is satirized with sharp teeth by the SOUTH PARK team). Though the movie foists its poignant messages and silly character arcs on us (Dennis has never committed to or finished anything in his life; with the marathon he has the chance to change his destiny! ), it actually ends on a note of possibility rather than blah marriage blah Hollywood. Like I said, “British” sensibility, regarding the audience as marginally intelligent, rather than popcorn automatons. Why do women regard a man running from the altar as cowardly and impotent, but a woman running from her responsibilities as a bride “adorable”? Answer me that and stay big-mouthed, Julia Roberts. The irony is: the best aspect of Dennis’s shiftless character might actually be the one thing they all vilify him for – running from that altar! aka: RUN, FAT BOY, RUN. Starring: Simon Pegg, Dylan Moran, Hank Azaria, Thandie Newton, Harish Patel, Mathew Fenton, India de Beaufort, Simon Day.